Early domestic box office projections have Spider-Man netting over $1 million for the movie's opening weekend. Early reviews and word of mouth seem to be fueling these positive projections and it's looking like Homecoming will eclipse the Amazing Spider-Man movies that opened with $62 million and $91.6 million respectively. MCU's Guardians of the Galaxy Vol. 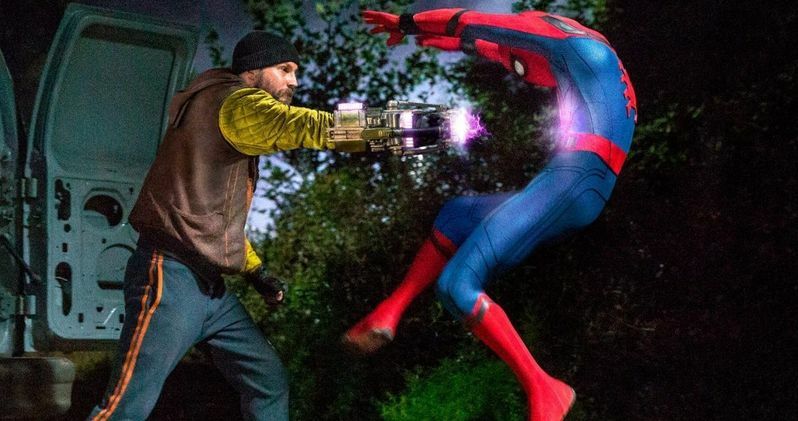 2 is still the top grossing movie of the summer, currently sitting at $383.4 million domestically and Sony and MCU are looking at another hit on their hands with Spider-Man: Homecoming. Deadline reports that Sony is estimating Spider-Man: Homecoming, starring Tom Holland, will gross around the $80 million mark, but other sources are estimating over $1 million domestically and possibly $190 - $210 million worldwide. Homecoming is already off to a $3.5 million start in South Korea, which is higher than Doctor Strange and Guardians of the Galaxy 2 and may be an indicator that the movie may exceed Sony's estimates. Though the estimates are good, they still don't show the new movie beating out Sam Raimi's third installment, Spider-Man 3, which took in $151 million on its opening weekend back in 2007. The positive reviews keep coming from both fans and critics. Rotten Tomatoes currently has the movie at a 91% with over 100 reviews and an average score of 7.5/10. In addition to the great reviews and word of mouth, Homecoming is benefitting heavily from its involvement in the MCU. Tom Holland's debut as Spider-Man popped up in Captain America: Civil War and the first installment of the trilogy stars Iron Man as a mentor to the young Spider-Man with more Marvel characters coming into the trilogy as it progresses. Plus, Holland will end up in Avengers: Infinity War as well, setting up a new character stream within the MCU and Sony. Thor: Ragnarok was originally slated for a July release, but it was pushed back to November in order to give Spider-Man his own launch time. But that was before Sony and Marvel came to an agreement about letting Spider-Man play in both worlds, which is definitely not the case for the upcoming Venom movie starring Tom Hardy, which will not take place directly within the MCU. Thor: Ragnarok is scheduled to do some reshooting in Atlanta next week with a casting call looking for tall buff dudes to be extras in the movie, so it appears as if the movie adjusted its schedule after the Marvel/Sony deal was reached. Spider-Man: Homecoming opens in 3,450 locations at 7pm tomorrow and then up to 4,341 theaters on Friday and can still run into some competition from Despicable Me 3, which was released over the holiday weekend. We'll have to wait until the weekend to get the official numbers, but Homecoming is well on its way to a number one weekend and probably an overall great turnout if the word of mouth continues to spread. Much of DCEU's Wonder Woman owes of its success to really strong word of mouth, making the movie into DCEU's highest grossing movie to date.